Even though the Berkeley Patriot, a student group, canceled Berkeley’s “Free Speech Week,” a left-wing counterdemonstration went on as scheduled from noon to 2 p.m. Monday on the crescent lawn on the western edge of the UC Berkeley campus..
About 200 people attended the rally, which ended with a march through campus and a brief occupation of Wheeler Hall. A police contingent of about 100 officers monitored the rally, but stayed mostly to the side. “This was the second time we chased Milo out of here,” he said, a comment echoed by several speakers during the rally. Alan claimed there were a number of Nazis in Monday’s crowd, but they were “singletons” and thus could not take on the crowd. 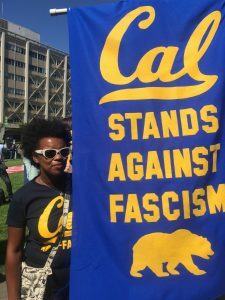 “I am glad the focus was on us and our solidarity rather than white supremacist trolls who are trying to intimidate minorities on campus,” he said. The rally was organized by a new coalition called Unite Against Right-Wing Violence in the Bay Area. According to the Facebook page for this event, the coalition is a diverse mix of more than 30 local and national groups. 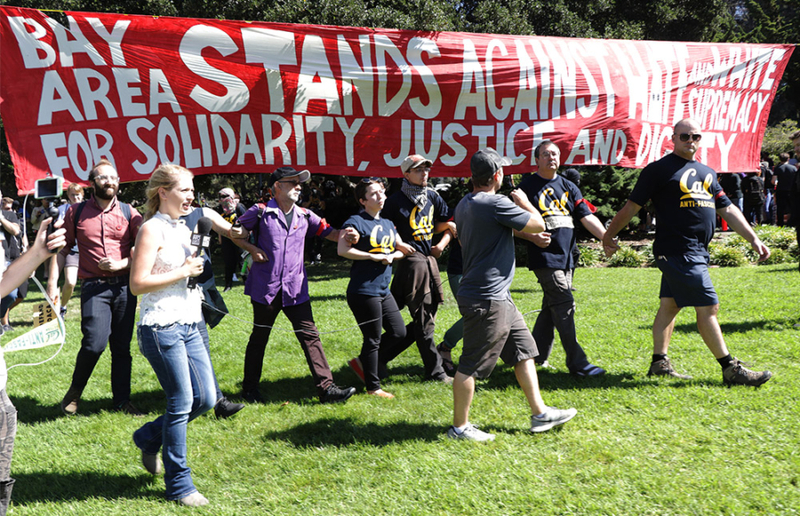 They range from Berkeley Citizens Action to Berkeley Law Students for Justice in Palestine; from the Cal ACLU to the NorCal chapter of the Communist Party USA; from Cal Berkeley Democrats to the International Socialist Organization; and from Refuse Fascism — Bay Area to Labor for Standing Rock and the Lakota People’s Law Project. UC Berkeley Professor Leigh Raiford. The two-hour event started with a gentle nod to the 60s, as two guitarists led the crowd in “Gracias a la Vida,” a song made famous by Joan Baez. (A surprising number of people, young and old, knew the words to the song.) After that, a series of speakers made speeches about the evils of fascism and the importance of protecting the rights of minorities and other vulnerable populations. They rejected white supremacy, racism, the militarization of UC Berkeley, and the “alt-right’s perversion of free speech.” President Donald Trump’s name was almost never mentioned. 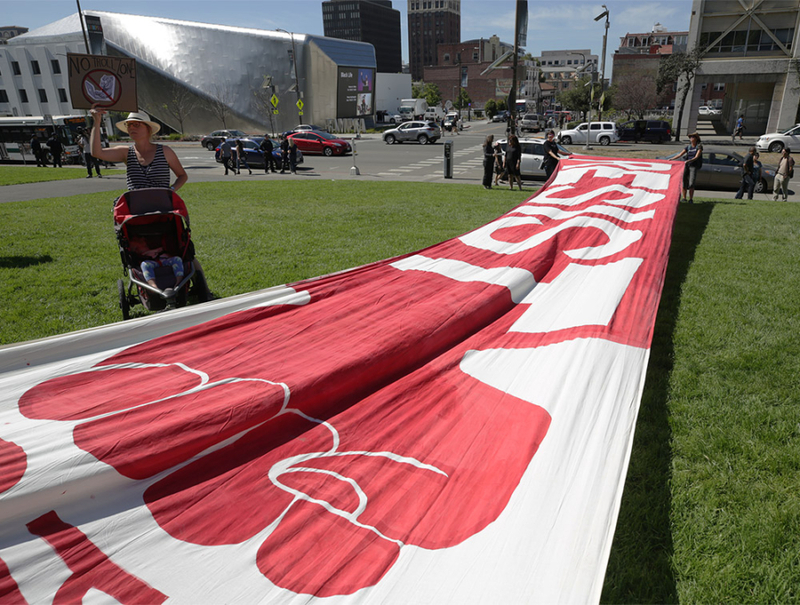 The group had produced large and colorful banners that were held by various individuals, yet they politely asked photographers not to take pictures that showed any faces. That was a nearly impossible task — the entire scene was very photogenic, clearly made for cameras — and photographers were everywhere. Some journalists were welcomed, but those who were seen as supportive of the far right were confronted, yelled at and asked to leave. Millie Weaver of InfoWars.com created the biggest stir, as many of those at the rally saw the news organization, started by Alex Jones, who called the Sandy Hook school massacre a hox, as an outlet spreading “misinformation to white supremacists.” A line of protesters wearing black and yellow “Cal Anti-Fascist” T-shirts linked arms and formed a line to prevent Weaver and others from getting close to the speakers. Eventually, they escorted her away from where she had been standing near the speakers. Weaver later posted on Twitter that her car had been vandalized and that someone had thrown urine on her. After about an hour of speeches, the rally began to move up the hill toward Wheeler Hall. It was a colorful sight with tall red-and-white banners flying, and drummers leading the group. 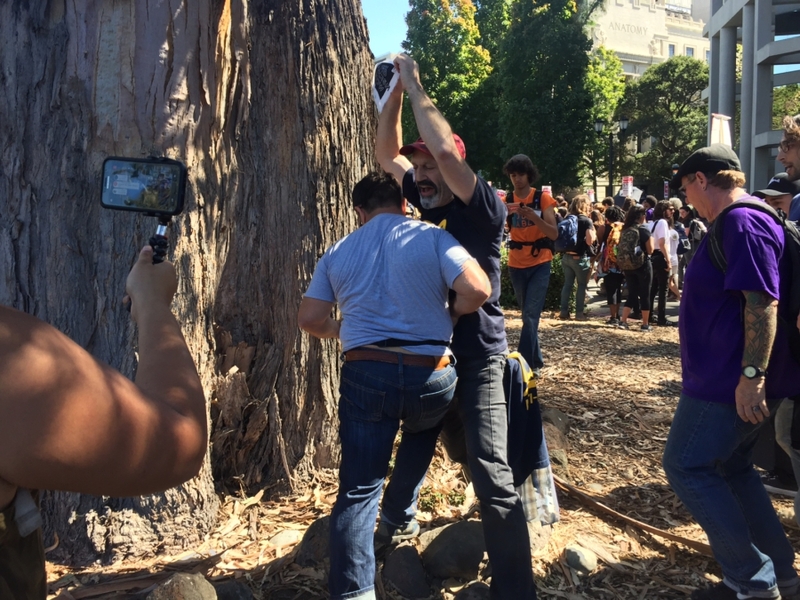 But early on in the march, a scuffle began between a counterprotester and two anti-fascist rally members. This reporter did not see the beginning of the argument, but suddenly a man was running through the bushes and being chased by two of the rally participants. They stopped a few times to yell at each other. The rally members were screaming, “Fascist go home! Fascist go home!” as members of the parade marching up the hill yelled, “What does democracy look like? This is what democracy looks like!” The marchers did not seem to register the scuffle happening right behind them, or the irony of their chant. It looked like the men would come to blows but, finally, they stopped in the middle of the road and the two men yelled: “You are playing with fire! You are playing with fire!” The lone counterprotester — for reasons clear only to himself — took his water bottle and placed it right in front of one of his assailant’s faces. The yelling continued, people were taking photos, and the police then intervened and broke up the scuffle. No one was hurt, and the counterprotester quickly left the scene. 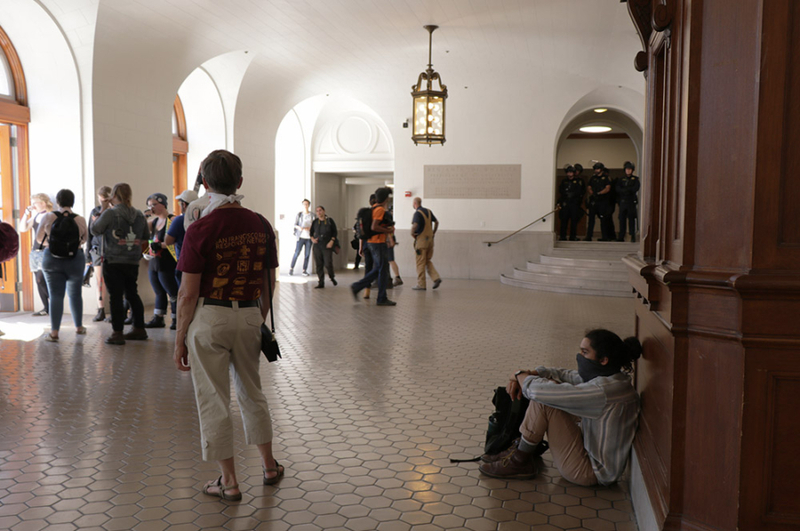 The group then marched up to Wheeler Hall, and announced — in Occupy back-and-forth chant style — that they were going to “Occupy Wheeler.” A small number of protesters entered the building, but police were already inside. Within a few minutes a fire alarm went off, the police closed off the corridors and stairways, and ordered everyone to evacuate the building. An officer said police had not set off the alarm, and they were trying to figure out what the situation was. 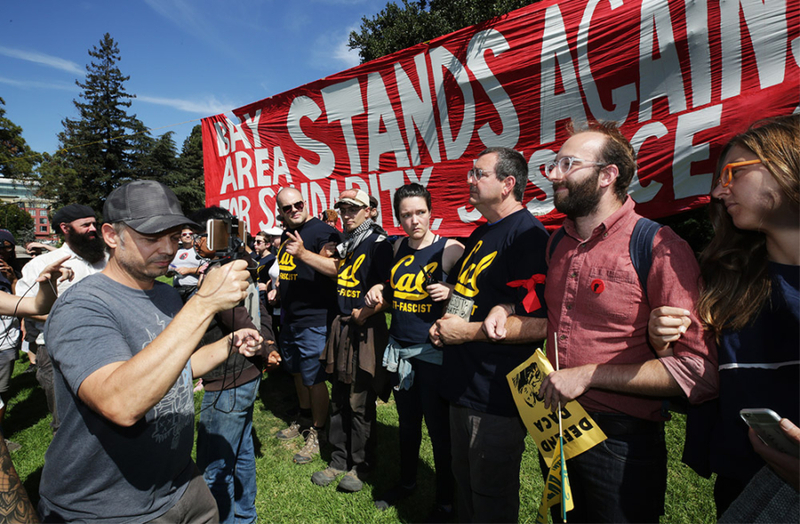 UC police arrested longtime Berkeley Copwatch member Russell Bates, 70, during the rally. He was detained on suspicion of wearing a mask at Wheeler Hall to conceal his identity, according to Sgt. 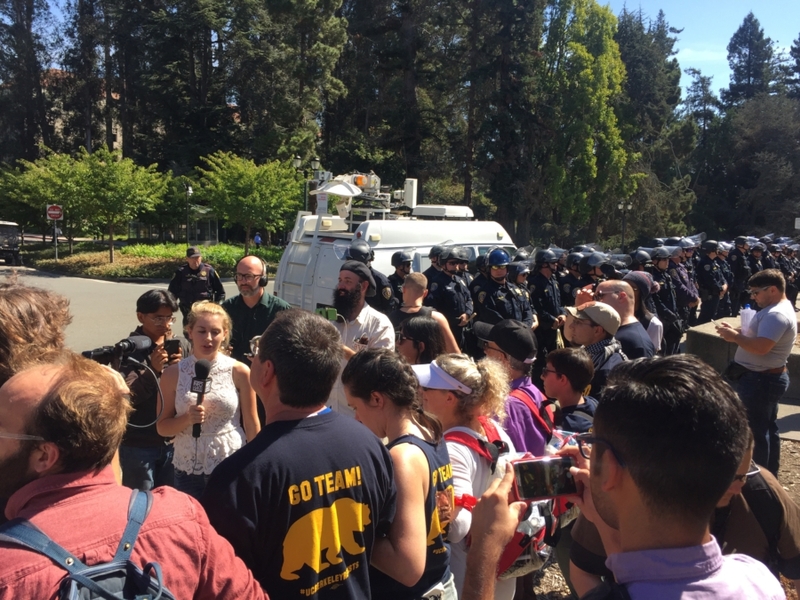 Sabrina Reich, UCPD spokeswoman. He was cited and released, said Reich. The rally continued outside Wheeler Hall for another 15 minutes or so, until precisely 2 p.m., when it was scheduled to end. Throngs of students began crowding the pathways as the period changed, quickly dwarfing the small rally. Because the cause of the fire alarm was still under investigation, Wheeler was closed and classes could not begin on time.